Is there pent up demand for a higher capacity fourth-generation iPad? Apparently, Apple thinks there is because a new 128GB iPad 4 SKU is coming to the Apple Store. What does this mean for existing iPad 4 configurations and prices? Step inside for the available details. Last quarter, Apple sold 22.9 million iPads, a new record. Although the company didn’t break out sales by model, given that both the iPad 2 and iPad 4 are in stock and ready to ship while the iPad mini is still backordered, it is clear where demand lies. Further, there have been rumors out of Asia that Apple has cut orders for 9.7-inch LCD panels used in the company’s full-size tablets. That said, Apple is said to be preparing to tap a new vein of tablet demand. 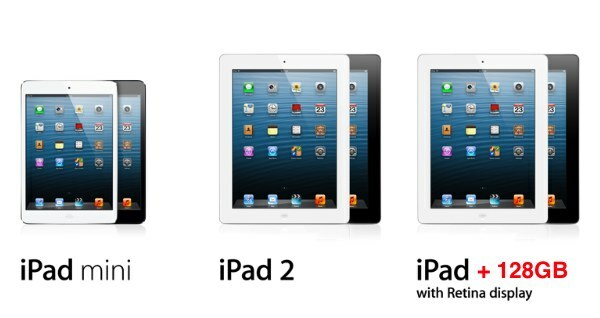 9 to 5 Mac reports 128GB iPad 4 configurations will soon be added to the company’s already extensive tablet catalog. We’ve gotten word from sources that Apple is preparing to release (in some fashion) a single, additional iPad model. This would be a new SKU for the current fourth-generation iPad with Retina display line. At this point, we do not have pricing information, so it is definitely difficult to pinpoint exactly what this new iPad model is. However, it is fairly certain that the new offering will be an updated iPad 4 and code snippets in both iTunes 11 and iOS 6.1 beta point to the imminent availability of 128GB iOS devices. 128GB iPad 4: Want One? Good, better, best? Apple is thought be preparing “ultimate” 128GB iPad 4 configurations carrying the P101 (wifi only) and P103 (wifi + LTE) model identifiers. Whereas 9 to 5 Mac seems certain that 128GB iPad 4 models will be added to the existing 16, 32 and 64 GB product matrix, wouldn’t it be interesting if Apple lopped off the clearly inadequate 16GB model and started their configuration chart at 32GB AND maintained existing prices? Boom.